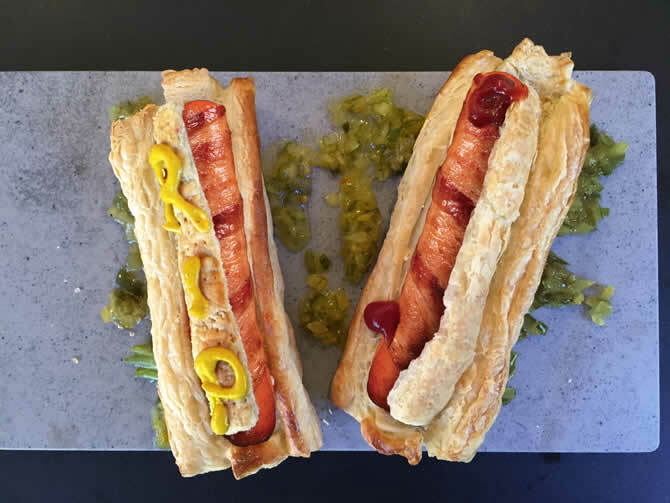 Hoffy beef franks go spooky with this delicious and fun Halloween treat everyone will relish! Heat the oven to 400°F. Line 2 baking sheets with parchment paper. Beat the egg and 1 Tbsp. water in a small bowl with a fork. Place remaining water in a small dish. Sprinkle the flour on the work surface. Unfold 1 pastry sheet at a time on the work surface. Cut the pastry sheet into 3 rectangles along the fold lines. Cut the pastry rectangles in half crosswise, making 6 (about 3x5-inch) rectangles. Cut 1/4 inch off each long side of 5 of the rectangles. With a pastry brush, brush water on long edges of rectangles and place strips on those edges. Repeat with remaining pastry sheet. Place the 11 pastry rectangles onto the baking sheets. With remaining 1 rectangle cut in half vertically and then cut horizontally in 1/4 inch pieces. These pieces will be place on short sides of each rectangle. Brush pastry rectangles with egg mixture. Bake for 20 minutes or until the pastries are golden brown. Let the pastries cool on the baking sheet or on a wire rack for 10 minutes. Once pastry is cool enough to handle cut around center portion of each rectangle for coffin lid and pry open. Cook Hoffy Beef Franks in oven or skillet until heated through, cut in half. Meanwhile place coffins on serving platter and surround with relish for a grassy feel. Squeeze ketchup in centers of coffins for the blood and place cooked, halved dog in each pastry coffin. Decorate tops of coffin lids with mustard.